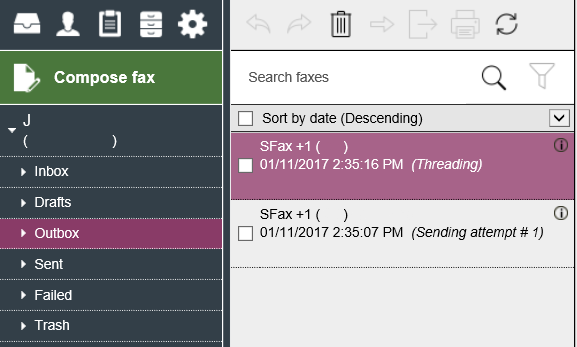 Sfax is built to send faxes in a single threaded method, so that we can attempt to reduce the chances that we receive a busy number failure due to overloading the recipient fax device. If multiple faxes are being sent to the same outbound fax number (by any Sfax user, not just within a single account), we will place any send attempts to a duplicate number into a “Threading” or “Queued” status, which means that the fax is currently in a queued status and will be processed in the order that it was received. The length of time that the fax will take is based on the size and volume of send attempts currently queued to the given number.